Our new online service provides our customers with a new tool in easily managing their printing needs. To understand how this online service can help you, lets look at fictional example. Bob has many requests for business cards coming to him on paper, if he starts to get backed up employees may resend the request and bob may accidentally order the same card twice. Fax transmissions may garble text thus making it more difficult to read the text on the request sent to the printer and the proof sent back to Bob. This could potentially lead to Bob signing a proof with an error. Use of large amounts of paper in faxing. Bob give access to employees to place orders for business cards online (not all employees need to be given access to order cards, Bob could still order cards for them). 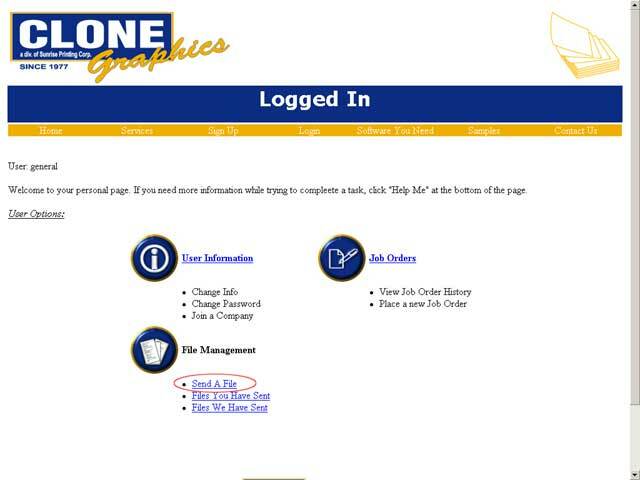 When an employee requires business cards they go to CloneGraphics.com and login to their personal page. The will be able to order the cards directly from the page. Once the order is entered, Bob will receive an e-mail containing the order information (and information on how to change or cancel the order) and the order will begin to be processed. Bob and/or the employee can then see a proof of the card online and approve the card for print. Cards are printed and delivered. No backlog. Since employees are placing orders directly, they know that their order is going through. If there is any doubt, an employee could always check the order history online to confirm that their order has been placed. No garbled text, less margin for error. Since everything from the initial order placement to the the viewing of the proof is done online, the text and graphics will appear clean and crisp. No fax paper wasted. There is no fax machine required for the entire process. Note: This example does not show the usefulness of easy online file exchanges. Want to see how easy it is to use this service? Below are step by step instruction on performing common tasks. If any of you needs to exchange files with us, simply signup for your own personal user account. Once signed up, you may login and gain access to your own personal page. On your personal page you will have the ability to send and receive files via a web based interface. 1. Once logged in to your personal page simply click on the "Send a file" link. 2. Now simply click "Browse" (A) and select the file you wish to send, enter a description in the description box (B) and click "Send File" (C). The file will be sent to us. Note: You must wait for the entire file to send. This may take some time, please wait for the confirmation page. That 2 step process is all that is required to send us a large file (up to 15 megabytes in size). 1. Once logged in to your personal page simply click on the "Files We Have Sent" link. 2. You may now browse through a list of files that you have access to. Simply click on the file name of the file you want to download (A) and you will begin to download the file via your web browser. 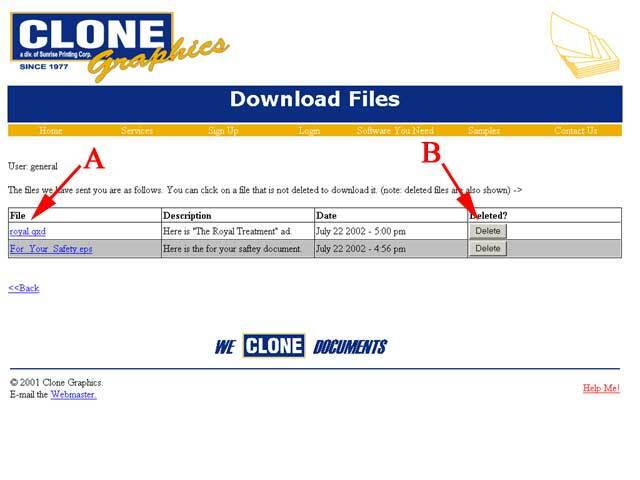 You also have the option to delete (permanently delete) the file if you no longer need it (B). Job ordering is slightly more complex to setup but once setup properly will allow you (our customer) a very quick and easy method of ordering common items like business cards and executive letterheads. 1. 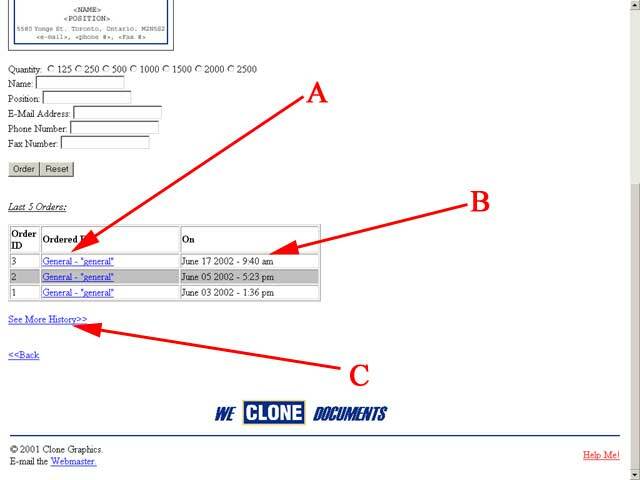 To setup job ordering, you must first request the creation of "a company" and "job order templates" for that company (A). We will setup both of these for you. 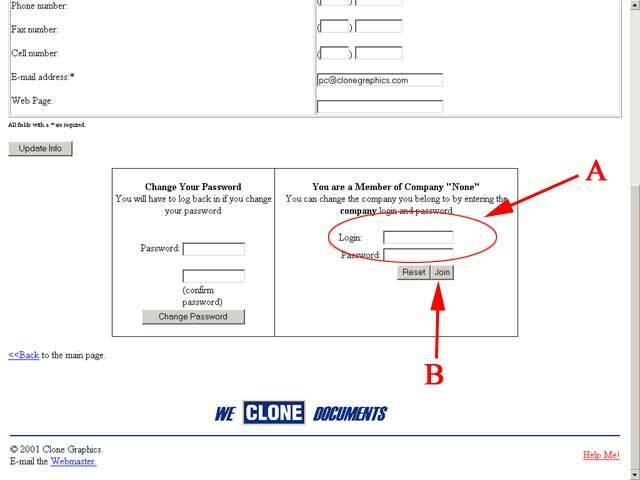 Once they are setup we will contact you with a "company login" and a "company password" (B). You can now give the company login and password to people (i.e. employees) whom you wish to grant access to placing orders (C). 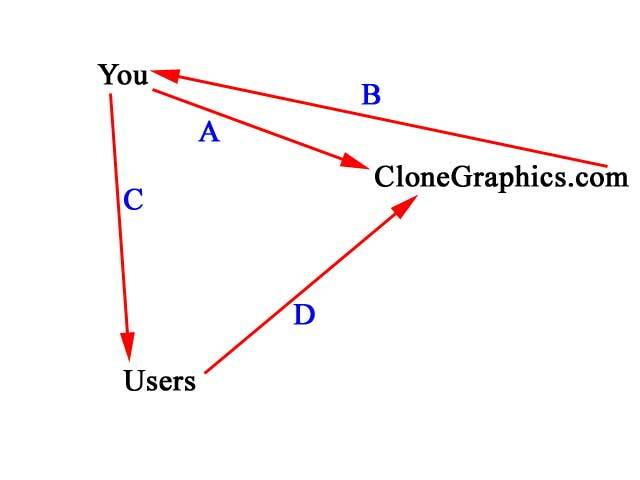 The users must now perform their own individual setups (D). 2. Each user who has been given access to place an order (they have been given the company login and password) must now "join" the company on the website. First they must login to their own personal page and click on "User Information". 3. 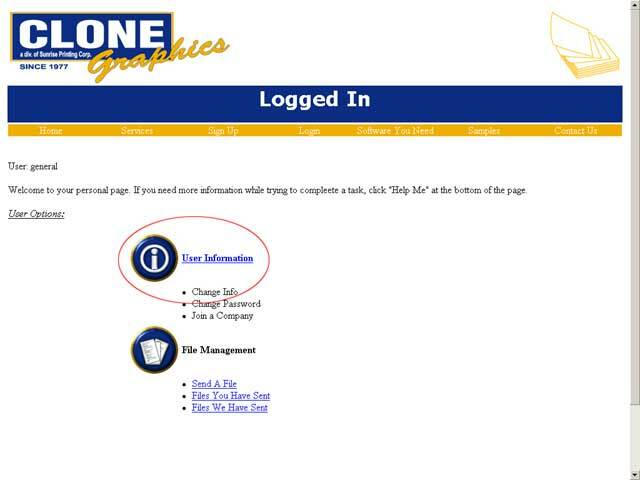 At the bottom of the "User Information" page the user must enter the COMPANY login and password (A) that was given in 1B. By clicking "Join", the user will join the company (b). The Setup is now complete and will not need to be done again. 1. Placing an order is a very simple task. Once a user is logged in they can begin to place an order by clicking on "Job Orders" (A) followed by clicking on the item they wish to order (B). 2. Next the user will be presented with an order form. At the top of the order form will be a sample of the product they are ordering (A). Underneath the sample there will be all the customizable options the user can enter (B). In the sample picture to the left the user is ordering business cards and the options include Quantity of cards and the name on the card. 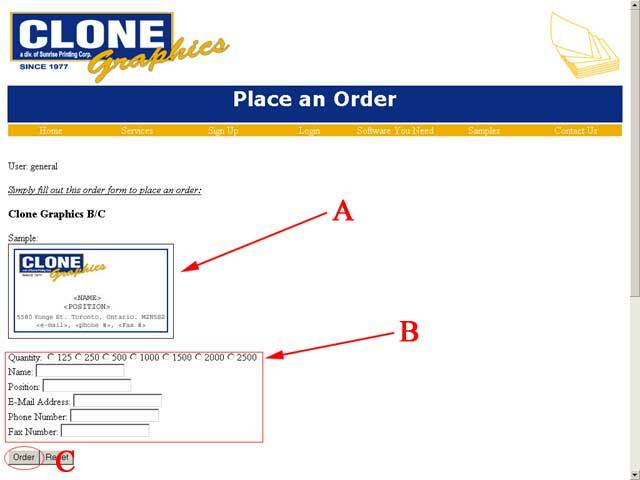 Once the user has entered all the information they may hit order to place the order (C). 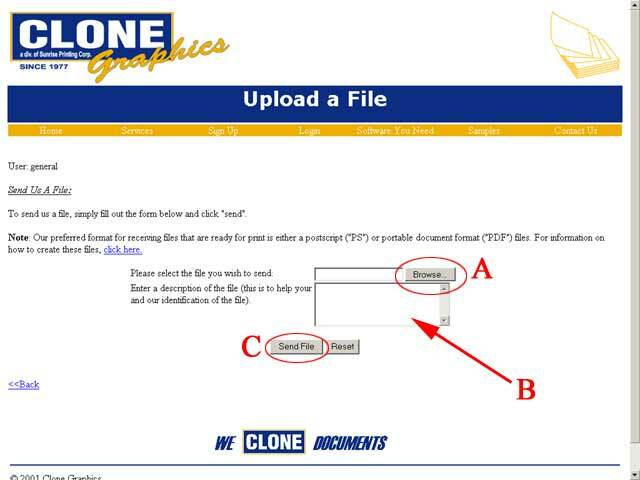 Once an order has been placed, an e-mail will be sent to the company e-mail address informing them of the order and the order will begin to be processed at Clone graphics. 1. To view order history the user must go to the order form for the product of interest. Once a user is logged in they can view the order history by clicking on "Job Orders" (A) followed by clicking on the item they want to see the history for (B). 2. Underneath the order form there will be a list containing the last five orders (A) and the time/date of the order (B). If you wish to see a longer list (containing all the past orders for the product) click on "See More History>>" (C). To see the details of a specific past order you can click on the name/username of the person who placed the order (A). 3. Once viewing the detailed order information of a past order you can repeat the same order by clicking on "Re-order This Item". 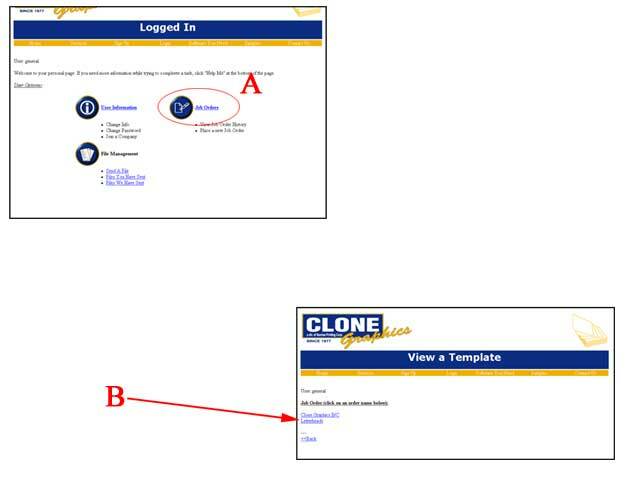 Once a user Re-orders an item, an e-mail will be sent to the company e-mail address informing them of the order and the order will begin to be processed at Clone Graphics.